@Karen_Belgrad I came here to post that exact Liz Lemon eyeroll. No one does it like Liz. Love this thread. Prince is the undisputed King of Sideeye. Absolutely my favorite movie of all time! It's how Olivia Pope "Handles It"
My queen here is Scully, who is basically one constant eyeroll. Oh-my-gosh! Scully! I... 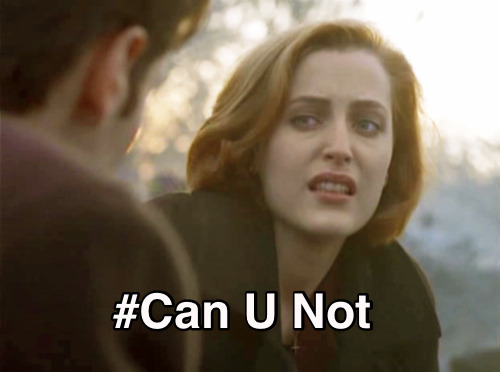 I just... my... she's... all I wanted in Highschool was to grow up into Dana Scully badassness. I even would blowdry my hair into the ginger helmet she donned every week! I wore suits to school, it was kiiiiiinda ridiculous. Please excuse me, that tumblr now owns my soul. This is not a side eye, but rather, what, hypnotism via enormous eyeball action? 'Does Gaga convince you to stay for another season?' Jessica was asked by the moderator of her show's panel discussion. 'What does that mean? I don't understand the question,' wondered the 2012 and 2014 Emmy winner for her various roles on American Horror Story. Jessica then seemed incapable of explaining further with words, opting instead to laugh slightly and roll her head in an exaggerated fashion. Who needs sunglasses when Jessica Lange has enough shade for the entire world. This - basically what I already see from my 9 year old son constantly!! @Anna_P Two of my favourite Dorothy Zbornak moments! That show will never get old for me. So many great moments @ashtangajunkie! I never knew my grandparents on both parents sides, so Dorothy Zbornak is my fantasy grandmother. I also want to be her when I grow up.